Author and Grief Counselor, Karen O. Johnson to Appear on the morning show “The Balancing Act” on Lifetime January 5, 2011 to Discuss her Book Griefabet: Everyday Letters to Wrap Around Your Heart. Local Show Times Are Posted Online at http://www.mylifetime.com/shows/balancing-act. 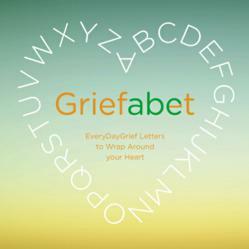 A Comfort Book for Anyone Living With Loss, Griefabet is a Perfect Condolence Gift. The Book’s Website, http://www.Griefabet.com, Includes a Forum Where Visitors Can Share Their Grief Story for Increased Healing and Support. The strategies for dealing with loss found in Griefabet will help our audience find peace and hope if they are experiencing any form of grief or loss. Karen O. Johnson, MEd, grief counselor, author and founder of EveryDayGrief, LLC, announced today that she will appear on “The Balancing Act” on Lifetime Wednesday, January 5, 2011 to discuss her book, Griefabet: Everyday Letters to Wrap Around Your Heart (Griefabet). Written for anyone living with loss, Griefabet is a perfect condolence gift, offering comfort on every page, in any order, on any day. The Griefabet website, http://www.Griefabet.com, offers increased healing and support through an online forum where visitors can share their grief story, either anonymously or by name. “The Balancing Act” on the Lifetime Network is a one-hour women’s morning show illuminating new ways for women to achieve success in all areas of their lives. Johnson will appear on the show on January 5th to discuss her book, Griefabet, and her thoughts on coping with grief and loss. Visit the Lifetime website for show times in your area. Griefabet can be purchased online through the Griefabet website for a special discounted price of $14.00 (free shipping) or through Amazon.com for $19.95. For more information on Griefabet, or to share your grief story, visit http://www.Griefabet.com/intro. Karen O. Johnson, MEd has been a grief counselor since 1981, providing individual and group counseling to a large population of youth, families, and adults coping with loss issues. She has four decades of experience as an educator and is currently the Area Chair, Lead Faculty in the Social Sciences Human Services Program at the University of Phoenix, Utah main campus. She is also the founder of EveryDayGrief, LLC, a company offering seminars for helping professionals. Karen holds a BA in English/Speech from the University of Utah, a Masters of Education in School Counseling from Brigham Young University, an Administration Endorsement from Utah State University, and English as a Second Language Certification from the Utah State Office of Education. Karen is also a certified laughing yoga instructor and a Human Services-Board certified practitioner. weekday mornings from 7:00am to 8:00 am (ET/PT) -- and is America’s premier morning show that’s about women, for women, and trusted by women. Celebrating life and all there is to accomplish, The Balancing Act inspires and empowers with entertaining and educational segments, placing women in the best position to achieve success in every area of their lives. For additional information or to view the show visit: http://www.TheBalancingAct.com.